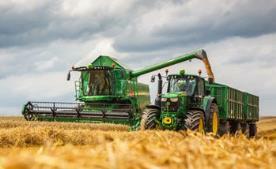 John Deere 6R Series Tractors feature the reliable and proven PowerTech PVS 6.8L and PSS 4.5L engines. These air-to-air aspirated engines deliver a power bulge above rated power to provide excellent torque in demanding applications. To match the engine power characteristics and improve the operation economy of the machine, the rated engine speed is 2100 rpm. The PowerTech PSS 4.5L uses a wastegate and a fixed geometry turbocharger, providing the torque rise and engine response needed to meet varying load conditions. Fresh air is first drawn into the low-pressure fixed geometry turbocharger and compressed to a higher pressure. The compressed, higher pressure air is then drawn into the high-pressure VGT, where the air is further compressed. By splitting the work between two turbochargers, both can operate at peak efficiency and at slower rotating speeds. The VGT is electronically controlled and actuates the turbo vanes as required to maintain peak engine performance. PowerTech PVS 6.8L engines only have a VGT turbocharger. The turbocharger’s vanes are in the exhaust flow. The opening or closing of the vanes changes the outlet volume and airflow speed against the turbocharger turbine. When exhaust flow is low, the vanes are partially closed. This partial closure increases the pressure against the turbine blades to make the turbocharger spin faster and generate more boost pressure. The ability to keep the airflow at optimum levels provides more consistent engine boost pressure and the ability to respond to load quickly across the entire engine rpm range. 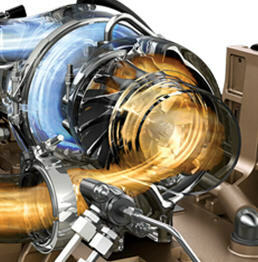 This system is without the turbo lag that can be found on some engines. Air-to-air after cooling lowers the intake manifold air temperature and provides more efficient cooling while reducing cylinder firing pressure and temperatures for greater engine reliability. Since lower temperature air is denser, a higher volume of air flows into cylinders so the engine is capable of meeting the increasing horsepower demands. Lowering the intake manifold and cylinder temperatures also aid in lowering the combustion temperature, which lowers the NOx produced as a result. Every PowerTech PSS 4.5L engine utilizes a HPCR fuel system to efficiently supply fuel to injectors. The high-pressure fuel pump instantly responds to requirements for more or less fuel flow or pressure. This electronically controlled, high-pressure pump delivers pressure on demand according to the application requirements. Pressure on demand ensures an efficient injection system resulting in high-injection pressure independent of engine speed. The ECU uses signal inputs from sensors and pre-programmed performance modeling to control critical engine functions such as fuel quantity, injection timing, air-to-fuel ratio, multiple fuel injections, amount of cooled exhaust gas recirculation (EGR), and a host of other control parameters. 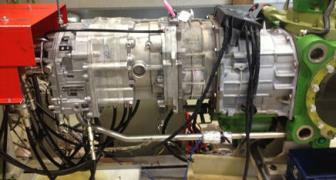 Each injector is controlled individually by the ECU. 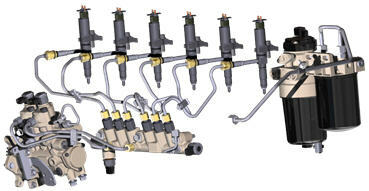 The ECU turns the injector on and off during each firing cycle to control the fuel delivery into each cylinder. 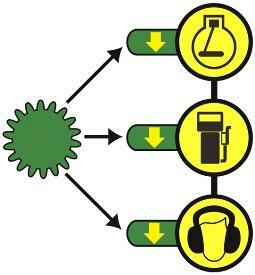 This management system is connected to the transmission, allowing the engine and transmission to respond simultaneously. Cold weather and high-altitude compensation are also precisely controlled for quality starts regardless of weather and maximum performance at high elevations. The ECU also features improved diagnostic capabilities. It is faster, has more working memory, and is responsible for monitoring and executing all aspects of the integrated emission control system. The 6M Series Tractors offer a closed-center PFC hydraulic system with 114 L/min (30.1 gpm) of flow, allowing 200 bar (2900 psi) of variable working pressure in base on all models. The hydraulic system is load sensing, which means a valve on the pump immediately initiates pump flow when required. When flow is no longer required, the pump returns to low-pressure, no-flow standby mode. Pressure for the entire system is established by the function requiring the highest pressure. As load decreases, so does the hydraulic pump pressure and engine power requirements. Hydraulic and transmission systems are functionally separate; however, both systems utilize a common reservoir for easy serviceability. With PFC hydraulic system, an extra 12-L (3.7-gal.) oil reservoir is available to increase the oil withdrawal capacity of the hydraulic system. 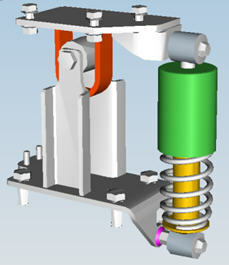 This permanently allows the optimum oil level of all drive components, with advantages for durability and efficiency. NOTE: Not for 6M Open Operator Station (OOS) Tractors. 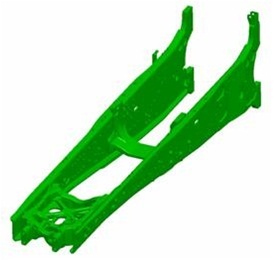 The strong steel frame has been a John Deere industry exclusive since 1992, providing profound advantages over competitor solutions. Below is a table demonstrating the available wheelbase measurements for all 6M models (mm/in.). 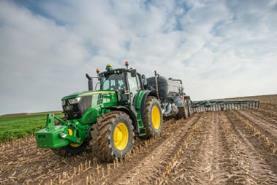 This unique solution achieves higher payloads without increasing tractor weight, thus increasing productivity. The engine is separated from the full-frame design using rubber bushings. 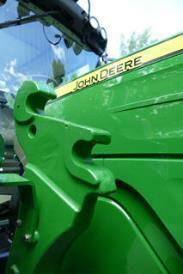 This method reduces the noise and vibration from the engine, ultimately improving tractor uptime and operator comfort. Full frame carries the load while the powertrain transmits engine power to the final drive. This reduces stress on mechanical components thus improving uptime and reducing costs of operation. Higher power density is delivered by separating the load carrying components from the power transmitting components, allowing optimized designs and operator performance. Loader brackets mounted directly to the full frame, therefore loader forces are not transmitted to the engine or transmission. Frame mounting allows easier component accessibility without disturbing other systems. Complete modular component replacement, such as transmission and engine is achieved without splitting the tractor in half. The newly introduced mechanical cab suspension (MCS) offers even higher levels of comfort to operators. For operators wanting superior operator comfort and smoother driving, mechanical cab suspension is available for all 6M Series Cab Tractors. The mechanical cab suspension reduces operator fatigue and discomfort, especially for applications requiring long hours inside the cab. 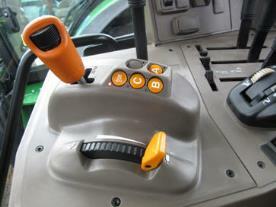 The system also provides stability to monitors in the cab during use. The cab rests on two fully integrated shock absorbers which dampens the vibrations coming through the frame. The suspension range is set to +/- 50 mm. In addition to having a smoother ride, the cab is more isolated against noise and vibrations from the engine, transmission, and chassis compared to the base equipment cab. 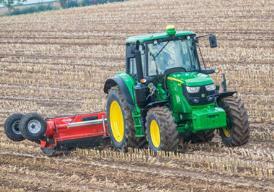 The CommandQuad PLUS gearbox is an option on all 6M Cab Tractors. The CommandQuad PLUS Eco maintains the impressive reliability of an AutoQuad™ transmission while enhancing operator convenience and productivity through increased automatic shifting capabilities. The transmission is equipped with 20 forward and 20 reverse (20F/20R) speeds for the top three models (24F/24R for the 4 cylinder models), a left-hand reverser, and four PowerShift gears in five fully synchronized ranges (6 range transmission for the less powerful models). The selected powershift is displayed on the digital display (1 to 4). The CommandQuad PLUS Eco operates at speeds as slow as 2.5 km/h (1.56 mph) with rolling circumference index (RCI) group 47 rear tires. Max speed is limited to 40km/h (25mph). The speed chart demonstrates excellent gear overlapping capabilities. Similar results would be seen throughout the 6M range. Control, operation, and fuel efficiency is optimised with this system. At maximum speed of 40km/h (24.9 mph), the eco system automatically reduces the engine speed to 1550 rpm (for the 6195M, with similar results throughout the range). 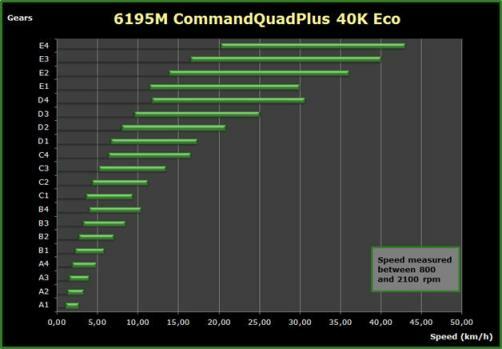 CommandQuad PLUS Eco features two different ways to operate transmission range and speed selections. In manual mode, the operator has the ability to shift through speeds and ranges without clutching by moving the control lever forward, toward the + indicator, or backward, toward the - indicator. 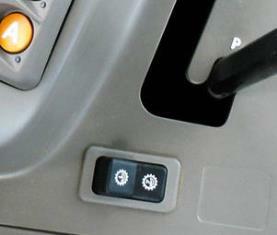 In AUTO mode, the tractor shifts automatically at present shift points depending on engine load. Depending on load, full AUTO mode will optimize both the engine and transmission by selecting the appropriate gear and rpm to optimize fuel efficiency. The only input needed from the operator is to set the target ground speed by using the thumbwheel. This electronic engine-transmission communication smoothes the four-speed power shift steps. During upshifting, a slightly lower engine rpm than the current one is commanded by the transmission for a few milliseconds to match the right speed. For down shift, the rpm is raised quickly and lowered again after the shifting has been completed. Soft shift is an intelligent system varying the degree of engine rpm reduction and increase depending on tractor load. 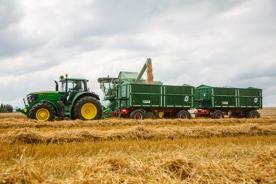 The soft shift system can be turned off if required, for example during baling. The speed matching control unit selects the next appropriate power shift step after shifting a range up or down, depending on the current speed. 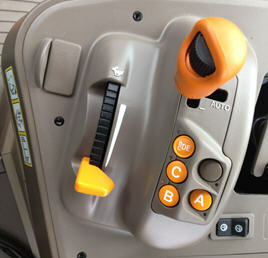 The operator can adjust in the dashboard if speed matching should be on, off, or off when PTO is engaged. Speed matching is available at over 7 km/h (4.4 mph). 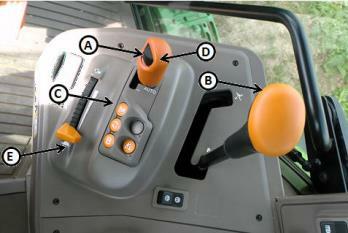 Once the tractor is started, the operator selects a range by pressing one of the range buttons on the control center. 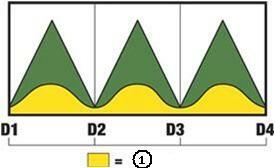 The ranges are labeled as letters: A, B, C and B-E/ B-F. The operator has the choice to select MultiRange, which allows seamless gear shifts and automatic range shifts without the use of a clutch or declutch button. The gear speed can be selected by using the transmission control lever to shift to a desired gear. After setting the desired throttle position, the operator can move the left-hand reverser to the forward or reverse position to start movement. The operator can shift up or down through the gears in the selected range(s) as needed. Initial start gear can be programmed through the digital display controls. Any two start gears may be stored. 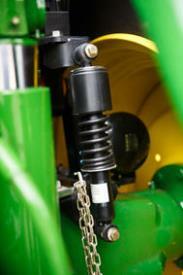 A load anticipation feature is standard equipment on all tractors equipped with a CommandQuad PLUS Eco transmission. The load anticipation feature allows the CommandQuad PLUS Eco transmission to predict how much load the engine expects from the activation of the hitch or a particular selective control valve (SCV) function. An SCV is commanded to flow more than 25 percent, or when it is in continuous flow, the tractor will boost the fuel economy engine speed. If the hitch is lowered (at a rate greater than 6 percent) or raised, the system will increase engine rpm if the engine speed is below 1500 rpm. NOTE: The load anticipation feature also activates when using SCV or hitch functions programmed within iTEC™ application sequences. NOTE: Refer to the operator's manual for complete instructions. The clutch automatically separates when the brakes are actuated and engages when the brakes are released. However, AutoClutch is deactivated if single-wheel braking is used while engine speed is higher than approx. 900 rpm. This means: if single-wheel braking is used to make a turn (for example), the clutch is not activated while engine speed is higher than 900 rpm. Changing the sensitivity setting of the AutoClutch alters the way in which the clutch separates automatically. This changes the time-lag between initiation of braking and the point in time when the clutch separates. If set correctly, this has a positive effect on braking characteristics when driving with a trailer. The lower the sensitivity, the greater the actuation of the trailer brake so that the hitched-up unit remains stretched. This also implies that more force is required to actuate the foot brake. AutoClutch sensitivity may be adjusted between four different settings – Low, Medium, High and Off. The option to adjust the sensitivity provides the operator with higher comfort and choice to optimize the tractor depending on what application it is doing. For example, high sensitivity for low speed yard work and low sensitivity or OFF for transport of heavy loads in hilly conditions. Allowing higher operator performance and uptime in the field, removing the need to depress the clutch – more time to concentrate on other important aspects of the tasks. For more information and transmission features, please view the Managing engine and transmission for maximum efficiency page.